The 12 outfits of Christmas: My greatest style inspiration of all...Happy New Year! For my last post of the year I wanted to thank you all for your support, your comments, your input and your loveliness, particularly when the going has been tough. Style Guile has grown beyond my wildest expectations and I have you all to thank for that. Some of you, I know, have been with me from the start and have watched Style Guile grow. The majority will have joined along the way. Some are family and friends and others have become friends. Some of you are on the other side of the world and from you, I love hearing about how sunny it is whilst we sit here in the rain and cold. If you look closely, you can see that not only do we share a love of "sweaters" but we also share the same hairstyle - other than our partings being on different sides. For today's shot I am in front of the fire - no rocking chair or guitar I am afraid - but I am sending you warm wishes, lots of love and soon I shall break into a Val Doonican song which, fortunately for you all, you won't be able to hear. Continuing with the theme of taking photographs in front of different Christmas trees, this weekend we are in Newcastle visiting friends for the New Year. Having two sets of friends who live there means that we can do lots of catching up. We have on occasion wondered why, when our friends from Birmingham move, do they go as far away as they can whilst still remaining in the same country (just)? Perhaps that is a question best not pondered too deeply. Given that we had a long trip in the car, being comfortable was important. I haven't yet worn this Warehouse jacket/cardi but wore it over a couple of plain tops together with a new scarf from French Connection. Black Jigsaw trousers and shoe boots served me well. Back to jeans and a jumper tomorrow for a walk along the beach, lunch out and various other activities. It's not going to be a glamour New Year's Eve outfit for me! Tonight it was all about the shoes! We went round to see some friends which meant that I could wear these ridiculously high shoes with an equally ridiculously thin heel. Less car to bar - more car to living room - but, luckily for me, the principle was still the same. I already had the shoes and trousers in mind but didn't really feel like going for a sparkly top or silk shirt so dressed it all down with a denim shirt. The shape of the pink coat - less girlie, more masculine, seemed to lend itself to the outfit - so that's the road I took. These black Zara trousers have a subtle leopard print worked into them. These glittery numbers, previously known as shoes and now re-named by the fashion world as single sole shoes because they don't have a platform (how totally bonkers is that?) were from Dune last Christmas. This is a pink Mulberry which I used as an oversized clutch. Luckily I was warm and comfortable and appropriately dressed, minus the heels, for a session of "Just Dance" - a great form of exercise which I think could be quite addictive! We are off up to Newcastle tomorrow so I shall bring you a couple more outfits whilst I am away and then I will give you all a much needed rest from me! With that in mind, if anyone would like to feature on Style Guile - perhaps you had a favourite outfit over Christmas, or a present that you loved wearing - please let me have your photos to share with the rest of us. Thanks to our eldest who wanted to spend her Christmas money, today I was treated to a couple of hours in the shops. Whilst it was very enjoyable, I must admit to being a little ambivalent about the sales. The best of the bargains were snapped up on Boxing day when the locusts descended and in any event they would probably still have run into a few hundred pounds. What's left still seems a little on the expensive side, although there are lots of nice pieces in Whistles - primarily cashmere and leather. No, I shall wait a couple more weeks to see whether the things that I have identified are reduced further. I think that the crux of the matter is that my sights have moved on to Spring/Summer '13 - not in a "I need to have" way but more of a wistful kind of way. The brighter colours, the lighter fabrics - they all just look so appealing. Which probably accounts for the fact that I left town with two pillow cases. For today's trip I wore grey GAP trousers, Primark jumper, Cos shirt, Topshop belt, Rockport loafers and a Reiss bag. I fancied mixing lemon and grey together for a change and I liked the pop of colour that the turquoise belt added - but of course others may disagree! The trousers are quite a good shape as although not a boot cut, they have a slight flare which does a good job of balancing out the hips. This evening saw us nipping out for some drinks so I wore the Whistles Isabella dress that I wore on Boxing Day together with a Whistles scarf (on the basis that it could add a layer of warmth if needed) Hobbs necklace, Boden clutch and Jigsaw shoes. I hope that everyone is still having fun and that for those who have had to return to work, it hasn't been too bad. Time to gear up for those New Year celebrations soon! Yesterday saw us visiting family in Leeds and I wore this Isabella dropped waist dress from Whistles. The great thing about it is that it is really comfortable and easy to wear and has the added bonus of being warm. In fact for once, I was very toasty. Our sister in law is Venezuelan and their house is truly tropical - even by my standards. On this occasion I thought that it could do with a flash of colour and so I wore this enamel necklace from Next. 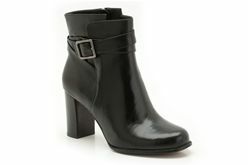 I also wore Hobbs NW3 shoes but it would work well with shoe boots, heeled ankle boots or a smarter court style shoes - depending on the occasion. Today we had friends dropping for lunch. I was at law school with my friend Jo and it's probably fair to say that we spent every spare moment that we had together chatting about clothes, rather than about the law. When she visits she always likes to have a look to see what new things I have in my wardrobe, which of course is just a good excuse to go upstairs and have another natter about clothes. Anyway, it being such a miserable day weather wise, I thought that sparkles were in order so I wore skinny jeans (high-waisted from GAP) - still one of my most comfortable pairs ever, my Zara sparkly flats which are serving me well, a Reiss top and a Jigsaw pendant. I'm off to the sales tomorrow for quick whizz around so I will see what I can find. I will try to adopt the advice that I gave on the radio on Boxing Day when, once again, I missed the first call from the station as I was in the shower. Last time I was in the bath. I seem to have developed a habit of doing most of my radio interviews in a towel these days but fortunately no-one has yet asked me what I am wearing at that particular point in time. Perish the thought! The 12 outfits of Christmas: Outfit 12 - Christmas Day! Happy Christmas everyone! I hope that you have had a fabulous day! For today's outfit I went for the full on Christmas ensemble which involved a Fair Isle neon sweater and Chunky Knit scarf which Santa kindly left for me in my stocking. I have it on good authority however that he and his elves rustled up a few spares which can be found in Jaeger Boutique. You know me - always a fan of something pink and something bright and something warm - so Santa was spot on. I love the neon pink band around the neckline and the cuffs as it keeps it on the right side of bright. I also wore a Boden hat for our trip out on a hunt for batteries and Blu-Tac. It wasn't really necessary to throw any more colours into the mix but if you can't be a little OTT on Christmas day, when can you? Cheerio everyone - I'm off to eat some Christmas pudding and the delicious shortbread that my friend gave to me - I mean us - as a present. The 12 days of Christmas - Day 11: Christmas Eve - don't you just love it?! As I stood there in my tracksuit bottoms and sloppy cardi just after lunchtime, my husband looked at me and said "Are you planning on getting dressed today?" It was a fair point and well made - albeit funny from the person who has no idea what he has in his wardrobe. In reality, everything was in place, it was just the dress that I needed to put on. However first of all I wanted to get to that stage in the day (washing done, floors swept, tidying up done) where I felt that Christmas could "begin". I first wore this Elm Dress from Hobbs when shooting the campaign for the Pavilions shopping centre at the end of the summer. I liked it so much that I went on to buy it but held off from wearing it until today. Unlike the black Jigaw dress which I wore a couple of days ago, it's less versatile but I liked the tartan print and the shape. I layered a blue top underneath for warmth and also wore a navy blazer with it when we went out. Warm tights are a must for me. I was working with a client a few weeks ago and she told me that the reason that she didn't wear skirts and dresses in the winter was because she was always too cold in tights. Well that was easily fixed! I hope that everyone's Christmas preparations are still going to plan. Not long now. Happy Christmas to you all! I threw yesterday's outfit on first thing just before heading out of the door in the pouring rain. I wanted to wear the dress and the boots were just handy. Rather than changing when I got home I just added in the scarf to bring the black and brown together. I know - it's lazy and I should have changed and posted something more inspiring. However it was a miserable day, my right ear was still pounding away and I didn't fancy stripping off. It was always my intention for Style Guile to be true to life - Christmas or not! However looking on the positive side, a black jersey dress with a bit of stretch in it is a really handy piece to have. I have worn this with shoe boots, bright red shoes and knee high boots - a blazer, a cropped bright pink cashmere cardi - a chunky oversized boyfriend cardi, a necklace and a whole variety of scarves. Essentially it is a great backdrop against which to paint a picture to fit your mood. The dress is Jigsaw, the boots, Kurt Geiger London, the scarf Oasis and the cuff Coccinelle. Today the rain finally stopped. 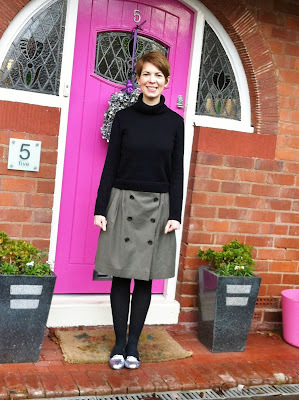 I felt that sparkles were the order of the day so put a Warehouse navy sparkly jumper with this printed skirt from French Connection. I also wore Hobbs NW3 purple shoes. Despite the height of the heels, they are sturdy enough to be comfortable when out and about. At home I just swapped them for my Zara sparkly flats which I have been wearing a lot of late. The skirt is far, far shorter than anything I would wear in the summer but that's one good thing about the winter - being able to wear short skirts with thick tights. It just opens up a whole new wardrobe of possibilities - which is always welcome. I love Christmas Eve - it's my favourite day of the year. I hope that your plans for a lovely Christmas are all coming together - wherever you may be and with whoever you may be. Talk about three in the bed and the little one said. Last night one said that they had had a nightmare. Another one said that they were scared of witches. Another one said that they were scared that the world was going to end - so they all ended up in our bed. Then one asked another one to stop coughing. Another said her leg hurt and one wasn't tired. Except none of the above was me. All I wanted to do was sleep! Having guests is such a great reason for tidying the house top to bottom, which is what I spent the first half of the day doing. With that in mind, flats were a must. I also fancied a printed blouse/jumper combo - just because it's a warm and comfortable option but it feels as though I have made a bit of an effort. Trousers were also a change from yesterday's dress outfit. This is a shot of the Zara coat done up, which someone asked for. We were on the way out to collect some anti-biotics that I need for an ear infection, so it was more a case of chucking the coat on for warmth. It sort of gives a flavour of it though. Now this is my idea of a good Christmas pressie - a great big bottle of sloe gin. Hic! Happy Christmas! Day 6 of my 12 outfits of Christmas saw me wearing this Hobbs NW3 Ashdown dress over grey Cos jeans. Possibly one of the warmest jumpers I own, it is lovely and cosy so I felt snug all day. In the closer shot of the jumper, it's possible to see the gold thread which is woven through it. I think that it just about qualifies as something a little bit Christmassy. I also wore these Clarks Lotta Beccles boots which are now unavailable online in black, although they are still available in tan. They are one of the most comfortable pair of boots I have ever owned, particularly given their heel. At £69.99 they were a good price too. I would imagine that there will still be some available in the Clarks stores for anyone who is after a pair. I also wore this H&M necklace as the jumper needs a little something at the neck, whether it's a scarf, a necklace or a shirt collar. So, that was me done for the day. It must have been a comfortable outfit because I am still wearing it even now whereas normally I would have abandoned everything in favour of PJ's. After I posted yesterday's blog, the Whistles scarf that I was wearing had an unfortunate encounter with a chocolate roulade. It somehow got caught up in it as I was rolling it up. Now I know why Mary Berry works in the print in her outfit via a Zara bomber jacket. As we were off to see my Mum today for a Christmas visit, I thought that I ought to wear some sparkle. I knew that not only would she appreciate it but also that I would blend in with the surroundings. My Mum is the Queen of Christmas decorations - no surface is left unadorned! I had intended to keep my top for Christmas day but I woke up feeling in need of a little sparkle as I think I have an ear infection. This Reiss top is so comfortable and warm (and a little sweatshirt like in shape) that, when paired with some black Jigsaw trousers with a cuff at the bottom, I could almost convince myself that I was in a comfortable shell suit. Perfect! The coat is a recent Zara purchase, which I also featured in an article for Easy Living magazine. Since buying mine, I have also seen it in a camel/black colour combination. Despite not being wool, the coat is really warm and comfortable too. Having chosen my Marc Jacobs handbag, we were good to go on our trip to see Grandma Pickles. After all these years of being a parent you would have thought that I would have realised that I have LESS time in the school holidays rather than more. So why do I still think that I will have more time to answer emails, write articles, respond to clients, answer blog comments and so on? Anyway, to anyone who is waiting for me to get back to them - sorry. I will do so soon, I promise. I was working this morning with my youngest client yet - a 14 year old girl. We hit the shops early and had a great time in all sorts of different stores. Knowing we would be whizzing round the shops, flats were a must so I wore Hobbs patent loafers, navy Cos trousers and a Jigsaw coral cashmere jumper - because colour is always good on a cold day. My jumper even elicited a (postive) comment from the smallest one. She always notices when I am wearing something bright and she really loves it, much more so than when I am wearing darker colours. A Whistles scarf and Orla Kiely bag brought it all together for me and I also wore my cream leather jacket. I can't pretend that there's anything remotely Christmas like about this outfit either - it's just a good, honest, feet on the ground, warm and practical outfit with a bit of colour and print involved. 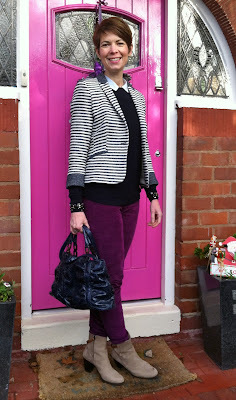 The 12 outfits of Christmas - Outfit 3: A trip to the cinema in GAP coloured cords with some Zara, H&M and LK Bennett added in. The main highlight of our day today was a trip to the cinema to see "Nativity 2 - danger in the manger." Don't we just know how to have fun? I love Christmas films and the fact that this one managed to keep all 5 of us entertained made it especially fab. Other events for the day included food shopping and feeding the ducks (see what I mean about knowing how to have fun!) - so it needed to be pretty low key. As part of my 12 outfits of Christmas, I wanted to wear some coloured cords. These are my GAP cords which I have worn several times before. I also wore an H&M cotton shirt, navy H&M jumper with sparkly cuffs (see below), Zara boots and blazer and navy LK Bennett snake print bag. Sadly for our eldest, she chose to feature herself in the best of a bad bunch of photos - which is why she is appearing here today. It is also a shame for me in some ways as it means that I can't now pinch her Johnnie B Christmas jumper to wear on here - or can I?! I knew that heels were out as an option for the day as there was a lot of dashing about to do. I also knew that a thick jumper was in order as my husband and I have very different thermometers. We play a game of cat and mouse in switching the heating on (me) and off (him). For some reason I felt that jeans were out so that really left a skirt that would look OK with flats. I have a few options but this one just felt right for today. Option one (above) is with the belt in view. Option 2 (below) is without. I don't want to peak too soon on the fancy pants outfits - that is if I even have any - which is why I kept it simple today. However the addition of my Zara sparkly shoes made it just a little bit festive for when we were decorating the tree - well that and my reindeer deely boppers. One of our tasks involved getting the smallest one some new school shoes. As we went into the shop she sat down and said: "I've come in for some new school shoes as I have trashed these. I have worn right through the leather." I was just waiting for her to say "So bring it on and let's see how long the next pair last." Instead she dutifully dismissed four pairs, boxed them up for the assistant, decided on the fifth pair and off we went. I think that both the shop assistant and I felt rather redundant. She also left with a pair of new pink trainers which will be a Christmas present and dismissed the purple snow boots on the grounds that they were "too purple." Oh help. Like mother like daughter. This time last year I ran a feature entitled "The 12 days of Christmas" during which, predictably, I showed an outfit a day for the 12 days leading up to Christmas. This year I'm calling the feature "The 12 outfits of Christmas". Why the title should be different when the content will be the same I have absolutely no idea - but there it is. Outfit 1 is what I wore to the school carol service yesterday. It is a lovely event - a full on affair, held in the chapel by candlelight with the pupils in traditional blue capes, the choir in their robes and the teachers having a "robe-off" of their own. It was observed that none of the teachers' robes had fur on them which is just as well because I may have adopted one of them as my own. The nature of the occasion made me think that it would be nice to wear my velvet(ish) Jigsaw wide leg trousers, which I haven't worn for a long time. They are lovely and drapey - and so comfortable too. It's also nice to have a change from skinny trousers/jeans. I know that some people have an aversion to lilac but I like it in small doses. This jumper is from Cos and underneath it I wore a white long sleeved T and a "collar on a bib" contraption from Cos. As the trousers are long, I needed a heel to go with them, so wore my Jigsaw shoe boots I am carrying a gold snake print purse with a purple trim, which is from Boden. I'm pleased to have given the trousers a test run in a place where a) it was dark and b) no-one saw them. Now that I am satisfied that I am OK to be seen out in public in them, I shall wear them again. Outft 2 is already in its planning stage! As for the picture, sorry about that. The 4 year old was the only one available to be David Bailey. Mum on the Run - Here's a little snake print mid heel court to pep up your wardrobe. OK, so I know that our weather might not be quite up for a no socks look - and I admit that this is another look involving skinny jeans but I liked this outfit (below, middle) that I saw Miranda Kerr wearing last week. It's simple, stylish and eminently "do-able" (as long as you are indoors, or at least not outside for very long). Miranda Kerr is wearing a polka dot court with her outfit. Initially I thought that they were a red snake print, which got me thinking about snake print shoes, which then led on to me thinking that a mid heeled snake print shoe would be a good addition to my wardrobe. Funny how these things happen isn't it?! Knowing that I had spied a pair when working at M&S at the end of November, I went to find them in our local store. And oh golly me - there they were! My size, great price (£15 - just in case you hadn't spotted the huge label in them below) not too high in the heel department and very comfortable. Oh yes, they will do nicely thank you very much. As one friend proclaimed - "they could be absorbed as part of the weekly household expenditure" i.e. no need for guilt or confessions! Unfortuntely, as is quite often the way with the M&S site, I can't find them anywhere online. However for anyone committed to the cause, the style number is T02/0459A and they do carry this style in most larger stores. Here's a side ways shot of them - just to demonstrate the height of the heel. I plan on wearing them with skinnies, fitted black trousers plus dresses and skirts too. The height of the heel is such that I could wear these at home quite comfortably without feeling either like I was going to topple over or that I was way over dressed. I like the idea of them with jeans and an oversized knit too. I might need to dig out a bit of spray tan for the ankles but thinking about it, it hasn't quite yet been put away for the winter yet anyway (which has more to do with not having got around to it rather than going for a Benidorm look, in Birmingham, in December) so that won't be a problem. 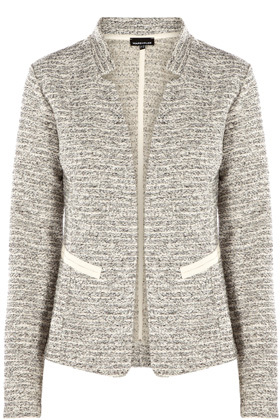 As an alternative - because it's always good to bring an alternative - there's also this Elizabeth court (£139) from Hobbs. I slightly prefer them but are they worth nearly 10 times as much? For those wanting to make an investment purchase possibly yes but for now, I am happy with my little £15 numbers from good old M&S. I don't know about anyone else but in the run up to Christmas I start to think of where we might be going, what we might be doing and who we might be seeing. Inveitably my thoughts then turn to what I might like to wear when we are out and about. By "out and about" I don't mean anything high brow but something along the lines of drinks with friends, visiting relatives, going to a carol service or entertaining at home. In that sense, for me it comes down to adding a few pieces to what I would ordinarily wear, just to lift my outfits a little. I dislike feeling over dressed, so the idea of wearing something party like when at home on Christmas day just doesn't feel right to me - much as I might like it to! With that in mind, if you too are looking for a little wardrobe pick me up, this Warehouse Lurex Tweed Jacket (£46) could be perfect. I saw it when styling a lady last week and went back to investigate further today. Although it's cut like a jacket, it isn't stiff or rigid and feels more like a cardi to wear. The shape is great too - no buttons, no collar, no lapels - no fuss, just a lovely, easy to wear piece. As for it's versatility, it would do a great job of pepping up a LBD that has had many an outing. It would also work really well with jeans of all descriptions - not just skinny ones - and it would work just as well with smoking slippers, brogues or loafers as it would with heels. It would also look great with tailored trousers, cigarette style trousers, peg trousers, wide trousers, a pencil skirt, a pleated skirt....you see where I am going with this? I think most of us could come up with at least three or four pieces in our wardrobe which would benefit from a little kick up the whatsit that this jacket could give them! Go on, have a think and I will too! Benetton Jeans - With new technology to lengthen the legs, raise the bottom and flatten the tummy. Could they really make 3 of us look like Elle MacPherson? I used to love Benetton but my relationship with the brand ceased when the Birmingham store closed. Since then it has never really come back onto my radar. Do you remember all those piles of neatly stacked v-neck jumpers in varying shades that we looked at lovingly in the 1980's? They were so lovely and calming to look at. I am sure that there was a Victoria Wood sketch in which she said that her idea of rebellion was to go into Benetton and mess up the neat piles of jumpers. So when I was contacted and asked whether I would like to try the new Pin Up Lift Jeans (designed to lift your bottom and lengthen your legs) I was hardly going to say no was I? Who could resist an offer which came with such promises? The jeans came with us on the girls' weekend to Wales because I thought that a few of us would be able to test them out. When I held them up in broad daylight I nearly fainted. They didn't look big enough for our 4 year old to get in - let alone me. Remarkably though I could get them on. They were snug but they went on. Just. Anyway here's my friend, Libby in them. She's 5ft 3" and they looked great on her. In fact we all decided that they were universally flattering. It's something to do with the even colour, the darts, the shape of the yolk and the shape and positioning of the pockets. This is another friend wearing the same pair and she too totally rocked them. She is 5ft 6" and a size 8 and is headless and nameless only because she thought that some of her patients might recognise her on here. She's never owned a pair of skinny jeans before but needless to say she now does - and they just happen to be these! Whilst I could get the jeans on - and could just about do them up on a good day, I wouldn't have been able to wear them for any length of time but that's more because I am probably a size 9 in jeans rather than a size 8. I liked the feel of them though and I thought that they looked amazing on the other two ladies. There's also another fantastic pair of jeans by Benetton which will particularly suit apple shaped ladies. They are the Pin Up Shape and come with a high waist, slight flare to the leg, side zip and a brilliant spanx type panel over the tummy. Genuis! Benetton also have a slim and regular fit jean, which are great for anyone who is after something in between a skinny and a boot-leg jean. At around the £45 mark, they also have a good price point. Given that the jeans were such a success for us three ladies, I thought that I would put them back on your radar too - after all we are always after the "perfect" jeans aren't we? *The pair of jeans that we tried were gifted to me by Benetton but I in turn gifted them to my headless, nameless friend as they looked so great on her. Mum on the Run - Boden Bits and Bobs!